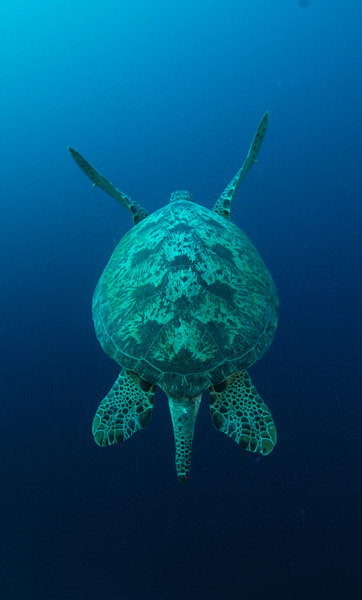 Highlights Discover these seldom dived atolls with vibrant reefs, current swept walls, a secret shark station and the famous Hanifaru lagoon, where large manta aggregations are common. 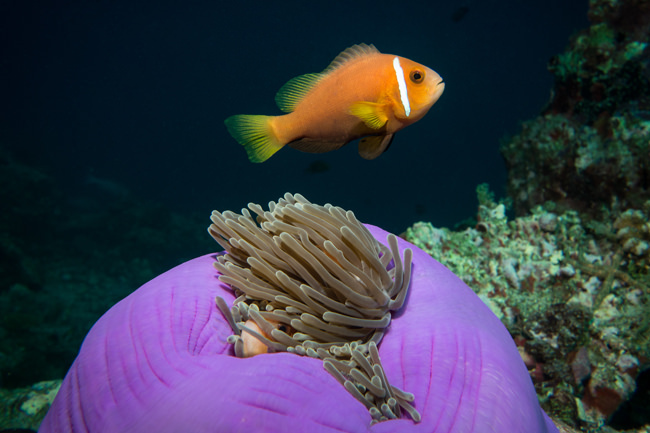 Baa, Raa and Noonu atolls are infrequently visited by most Maldivian liveaboards, which means scuba diving here is an exploration of the finest quality reefs cushioned in peaceful isolation. Join Amba on one of their special exteneded voyages all the way from Hanimandoo to Baa for a one off excursion through paradise! Leave the world behind you as you roam the virgin dive sites, encountering the smallest macro to the largest plankton eaters. Baa has become famous for the manta feeding lagoon of Hanivaru where massive aggregations are found in the late summer months (Aug - Nov). Depending on local tides and currents, you will stop here - we suggest snorkelling for the best encounters but when the manta are not in a lagoon they can be found on the surrounding reefs. Add shark sightings to your log book too! The shark cleaning station at Orimas in Noonu atoll is a sight to behold and Haa Alifu is a perfect for finding leopard sharks as well as reef sharks. This is a brilliant introduction to the Maldives with a bit of everything (drifts, pinnacles, channels, manta & sharks). The sheer volume of marine life in region makes this itinerary a great choice for photographers. 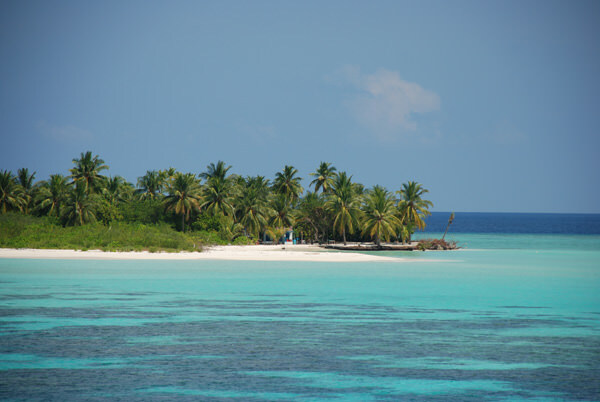 Baa, Raa are secluded and scuba diving in this region takes you away from the stresses of every day life. 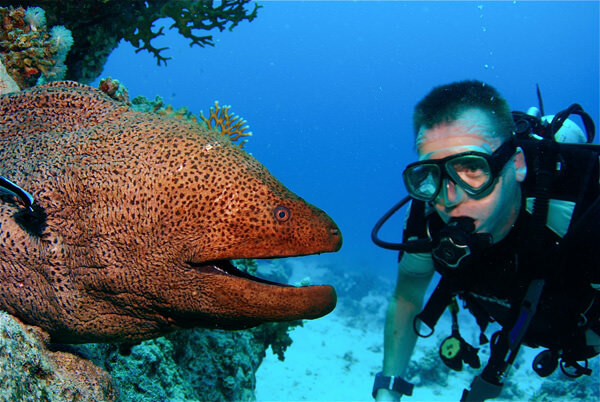 Amba's expert dive team have picked out the very best dive sites, visiting each at their seasonal best. 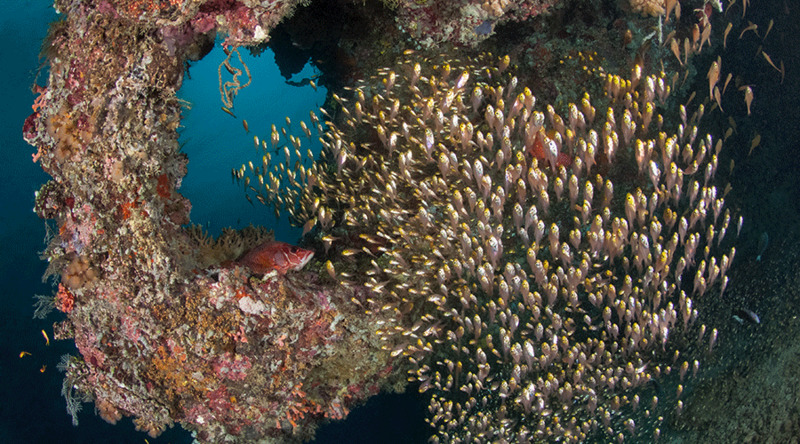 Adding to the excitement, the guides and crew are constantly on the hunt for new dives sites. When it comes to diving in the Maldives, the Baa, Raa and Noonu itinerary has all the ingredients needed to satisfy even the most adventurous spirits. 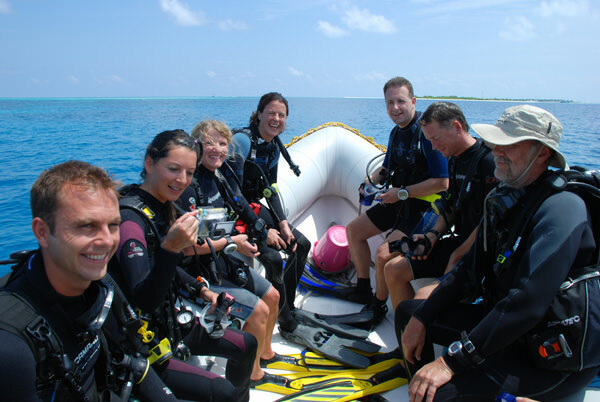 Scuba Travel run the Baa Raa Noonu itinerary nearly every week of the year so there is always a date to suit! Amba will alternate between starting the Baa Raa Noonu itinerary at Hanimandoo or Dharavandhoo. 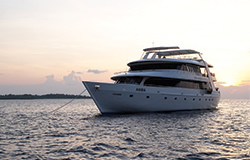 All of our Baa Raa Noonu trips run for 7 nights with 7 nights spent on board your liveaboard. There are normally 2-3 dives a day apart from on your first and last day. There will be 1 night dive during the week.. If your trip departs from Male you will be met on arrival from your international flight and taken directly to the domestic flight. There will be a full welcome briefing on arrival and you can set your kit up. If you have prepaid any rental equipment this will be given to you on arrival. There is then your first dinner and you can settle in for the evening. Depending on arrival times you may or may not dive on the arrival day. 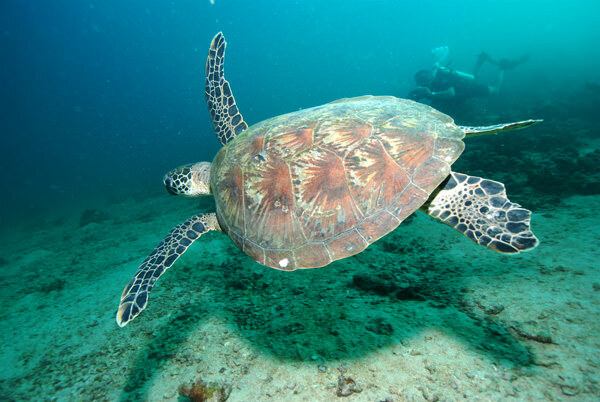 A normal Baa Raa Noonu itinerary will dive at the following areas but the exact dive sites and order will vary week by week depending on what people enjoy, where the best sightings have been and reflect diver experience levels. Look for leopard shaks in Haa Dhaalu! They often shelt from the currents at Anemone thila or Keylakuna thila. 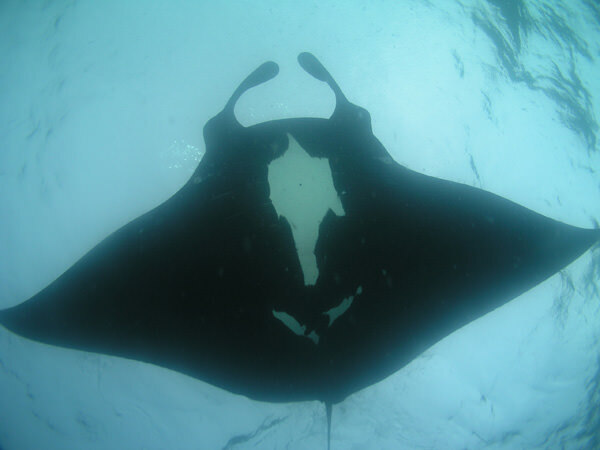 After the shark fixes, the time comes to look for manta in Haa Dhaalu. Nellaidhoo thila is a must, especially with your camera! Manta soar above a school of bat fish and giant travellies. Macro lovers will also be delighted with the wealth of nudibranch and flabellina, espcially at Theefarido thila. 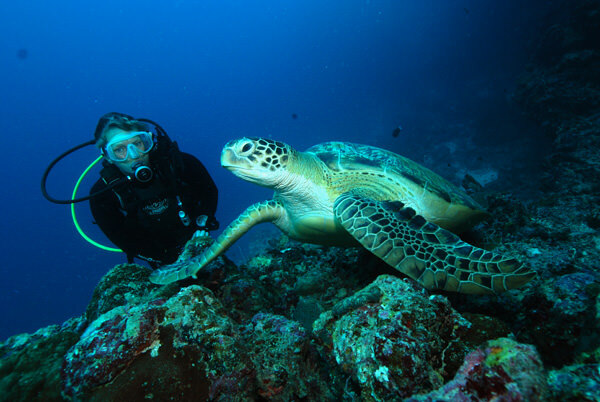 Bodu Cave is an unusual dive and easy for all experience levels. Dive through the shallow cracks as the light bounces off the walls - simply spectacular! Barrah Thila brings you face to face with schools of blackfin barracuda and Spanish mackerel. There are also yet more manta! The corals here are also some of the most beautiful with pinnacles a plenty to work your way around. In Baa atoll there are many sites to choose from. Dhonfanu Thila has a busy fish life and when current swept, sharks, eagle rays and napoleons will be seen. Dhigu Thila is usually the third dive of the day. A long ridge with good hard coral on top. 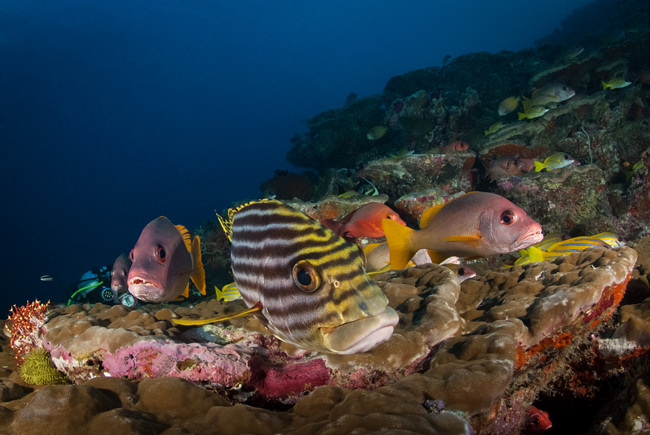 In slack water it is a great photography dive, in pumping current a long drift revealing a series of pinnacles that takes you on to another reef. During the Manta season at Hanivaru (July - November) one of the day dives will be substituted with a chance to dive or snorkel with this huge manta congregation. 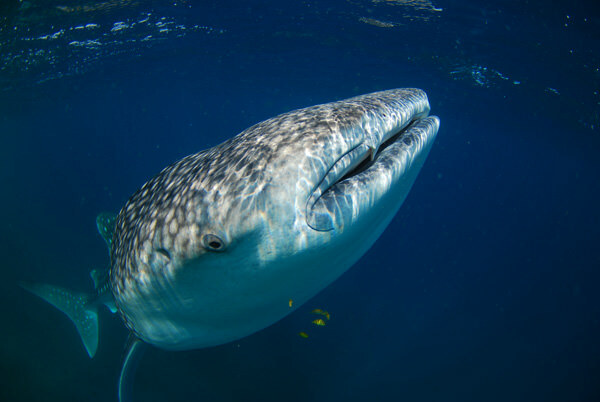 This is an incredible natural phenomenon and whalesharks are often also found, following the plankton into the lagoon. Maavaru Kandu is a long north facing channel wall. The many overhangs are festooned with a stunning array of soft coral nicknamed Swedish reef. from the predominant blues and yellows. While you are having breakfast, small journey north to dive 2. Fares, a remote shallow reef with large pinnacles on the western side. A real activity dive swimming around and through these huge rocks with good fish life and great coral. In season, a repeat dive/snorkel at Hanivaru can be made. Get your camera ready! 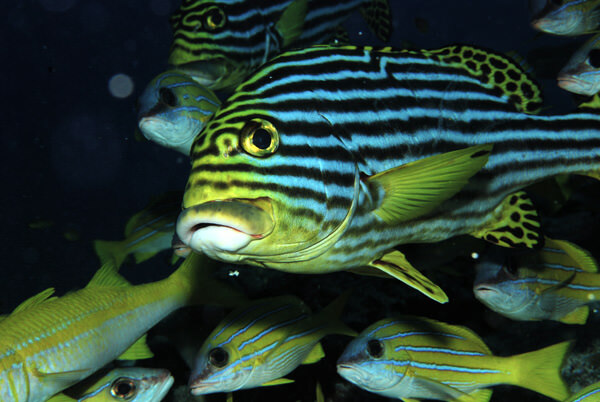 Fenfushi Giri is a shallow tiny site but with an amazing amount of fish. Often exposed to some current there are shoals of baitfish constantly hunted by Jacks and bonitos producing great viewing. After the diving there is another island visit planned - the uninhabited Fenfushi has a beautiful crescent shaped beach, stroll along this remote strip and watch the sun set. 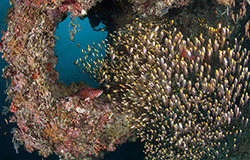 Reethi Thila is an exciting anemone smothered site with masses of fusiliers hunted by tuna and jacks. Only recently opened Noonu has some deeper sites producing some interesting and often challenging diving. Orimas Thila is in the middle of the atoll. 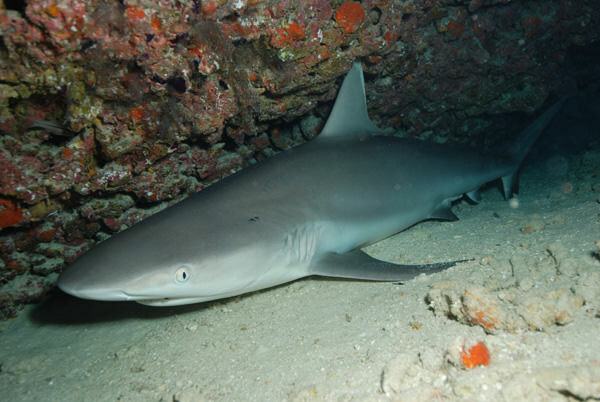 It is a small deep site and is the home to a grey reef shark population. With current sweeping across the southern tip the sharks can be seen coming in to be cleaned of parasites. Many juveniles can also be found here. The site is full of surprises with visitors coming in from the deeper waters. The third dive is on the north west side of Noonu. Dha Thaa Faru is a channel corner. A great reef shape with drop offs, caves, tunnels supporting healthy coral and an abundance of life. A short journey south brings us to Christmas Tree Rock. This is stunning tiny pinnacle with large overhangs and festive decorations of beautiful hard and soft corals. 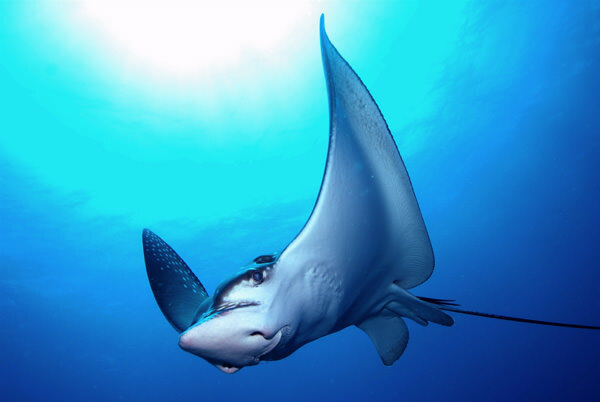 Presents of sharks and sting rays can be found tucked under the tree on the sandy bottom. 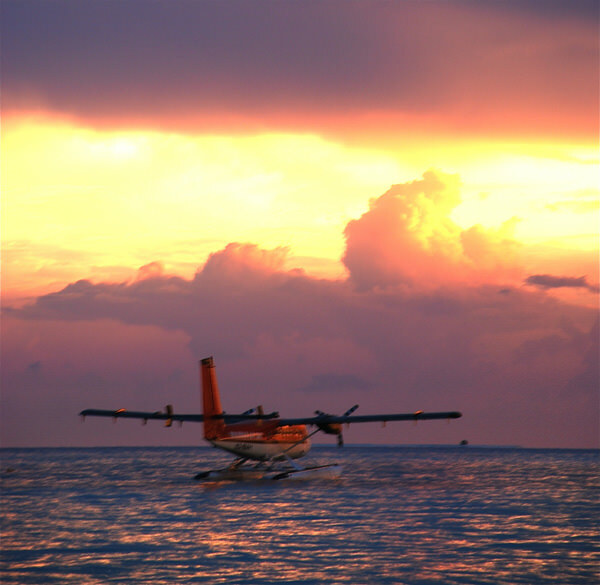 At the end of your liveaboard you will be taken to the airport for your domestic flight back to Male and your international flights.